We brought in some of our pumpkins a week or more ago now. So, I recruited my husband and son, Tim, and we brought in 12 pumpkins. I’ve since brought in five more. As they turn orange (or white) and appear ripe, I’m going to go ahead and bring them over to this side close to our house. Here they are on the back patio. I planted several white pumpkin plants. I was disappointed to see only two white pumpkins. I just went over to the garden before sitting down to work on this post and checked on the rest of them. Since it has decided to be so warm this year well into September, they are still growing and ripening. I think I have about 10 more. 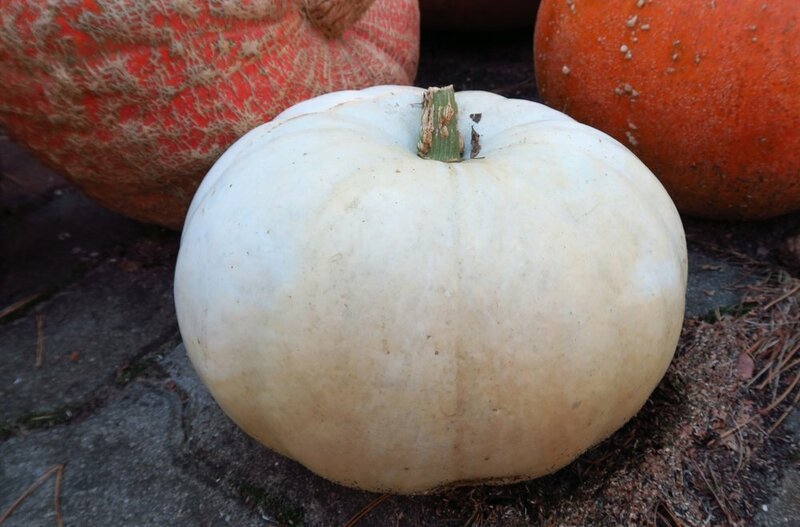 Right now I have 17 pumpkins and 3 butternut squash. 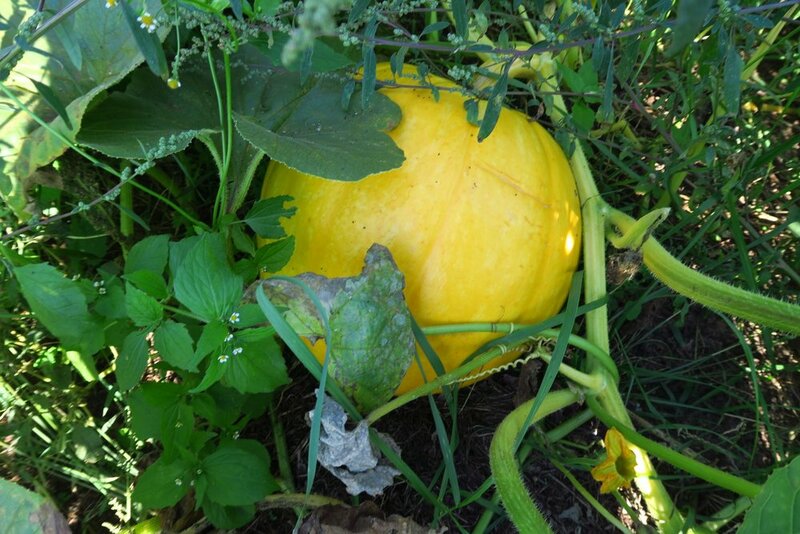 I have several more butternut squash coming and maybe 10 more pumpkins! 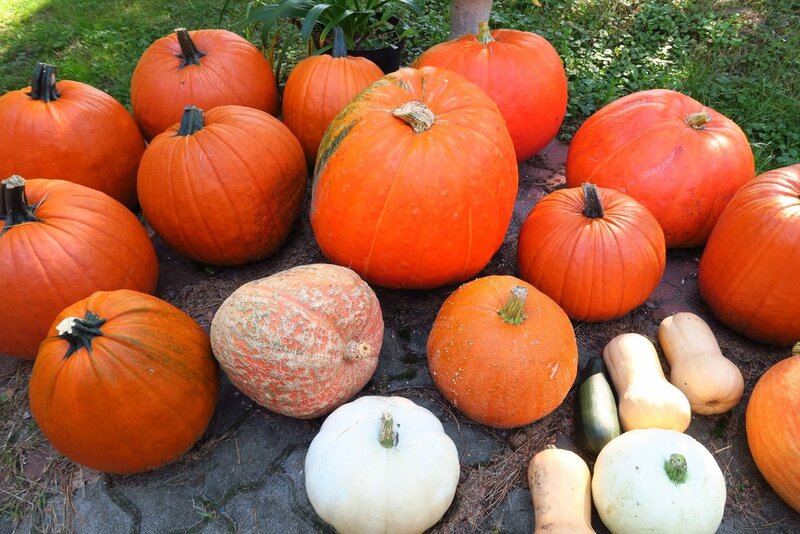 So, all in all, it’s been a great year for my pumpkins. I went over to the garden and got pictures of these that are still growing and maturing. My daughter in law said they were “well camouflaged”. That’s true. They hide very well - at least the green ones do. If they start out yellow or orange, not so much! I’ve had 23 zucchini from my 19 plants. I planted them very late in the season, so I’m grateful for all of them. I’ve given them all away. I really only planted them so that I could give them away! My husband doesn’t really like them and they are so easy and fun to grow/watch, that I thought the $1.50 it costs for two packets of seeds was well worth the fun in growing and good will created in giving them to neighbors who do love them! The other thing I’ve been doing with regards to preserving is apples. We were given some apples and I decided to dry them as my husband likes to use them this way. We’ve been running the dehydrator for over a week now. As soon as we finish the apples, I’d like to try a pumpkin and create some dehydrated pumpkin. This way I can save a lot of it without it taking so much freezer space! And now you know - that’s what I’ve been up to in the garden! Be sure to check out what my sis has for you over in the store! She’s working hard to keep you in fabric! These 19 half yard pieces are perfect if you don't want a whole yard, but you want to make something out of fabrics that you know will work well together. These are all from the same line called Boho Happy by Patrick Lose. Local quilt shop quality fabrics. We carry lots of other fabrics that would work well as backings and sashings for this adorable fabric pack! We will simply be folding these up and leaving them all together in one clump. The money we save in labor cost is passed on to you, so the money you're saving is your own! These 15 ONE yard pieces are perfect if you want a whole yard, and would like to add a whole set of Marble to your stash to pull out for any occasion.. This is a part of Rachael’s Picks Fabric Families. You can order coordinating yardage for backings or sashings. 15 Individual Pieces totaling 15 yards of fabric. We will simply be folding these up and leaving them all together in one clump. They will not be neatly tied and delivered in a bundle as the fat quarters are. This will save you money! These 17 half yard pieces are perfect if you don't want a whole yard, but you want to add a set of Spirals to your stash to pull out for any occasion..
17 Individual Pieces totaling 8.5 yards of fabric. The white and off-white versions of this same design have flown to the top of the charts of our best sellers! These 17 half yard pieces are perfect if you don't want a whole yard, but you want to add a set of Marble to your stash to pull out for any occasion.. These 17 colors are a different variation from the first 17, but still stunning! These 17 ONE yard pieces are perfect if you want a whole yard, and would like to add a whole set of Marble to your stash to pull out for any occasion..
17 Individual Pieces totaling 17 yards of fabric. These 10 half yard pieces are perfect if you don't want a whole yard, but you want to make something out of fabrics that you know will work well together. They are all from Patrick’s Lose’s line called Santa’s Stash. Santa’s Stash - Christmas fabric. These 11 half ONE YARD pieces are perfect if you want a whole yard of several colors of beautiful fabrics. This particular fabric family is by Hoffman and features beautiful fabrics with small patterns. Each fabric is in the same design, but in a different color. From the Hoffman fabric line. 11 Individual Pieces totaling 11 yards of fabric from Hoffman Fabrics. Beautiful fabric in interesting colors. These 16 half yard pieces are perfect if you don't want a whole yard, but you want to add a set of Confetti Floral to your stash to pull out for any occasion..
16 Individual Pieces totaling 8 yards of fabric. These 10 half yard pieces are perfect if you don't want a whole yard, but you want to make something out of fabrics that you know will work well together. These are all Rachael’s Picks, but I’ve handpicked some gray and caribbean fabrics that look stunning together. I’ve also made up half yard add-on packs if you want to add them to make up a specific color to your quilt. Beautiful combination of fabrics in a gray and caribbean color palette. This is the new baby room palette, but I made this pack up entirely genderneutral, so that you could use it either for a baby or an adult. You can also choose to add one of my two Caribbean/Gray Add on packs to make it a specific color. These 4 half yard pieces are perfect if you don't want a whole yard, but you want to add a bunch of blue and gray pieces to your Gray and Caribbean pack. Mostly Riley Blake fabrics but some beauty that will add to the Gray and Caribbean Combo to give it some pizzaz or define a gender, if you want. 4 Individual Pieces totaling 2 yards of fabric.